For several years, the Federal Aviation Administration has sustained a program of implementing Safety Management Systems at airports. Safety Managements Systems can be considered to be proactive approaches toward improving safety in the airport environment by means of four fundamental components: establishment of Safety Policy, performance of Safety Risk Management and Safety Assurance, and promoting a Safety Culture. Project 12 of PEGASAS, Airport SMS Software Analysis, involves the evaluation of the software programs currently available for providing aviation Safety Management System functions to airports. 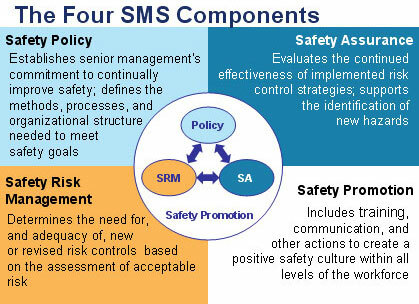 The goals are to ultimately present options for SMS software given minimum functionality standards and make recommendations for effectively implementing a Safety Management System and integrating SMS software into the program. The final recommendations will be published in an Advisory Circular following collaboration with the FAA as a set of guidelines to present Safety Management Systems as accessible means for improving the airport environment with respect to safety and efficiency. Airport SMS Software Analysis is led by Seth Young of The Ohio State University Center for Aviation Studies, who serves as the PEGASAS point of contact for this project, with participation of Southern Illinois University (subcontractor). The Phase I progress of the Airport SMS Software Analysis project was presented at the Aviation, Aeronautics, and Aerospace International Research ( ) Conference hosted by Embry-Riddle Aeronautical University, Prescott in Phoenix, AZ. Moving forward we are now beginning to work on the second phase of this project which includes the development of writing an Advisory Circular (AC) for the FAA to offer guidance to the entire US industry. Phase I of Project 12 was completed and the Phase I Draft Report was delivered to the FAA Technical Point of Contact, Lauren Vitagliano, for review. Phase I consisted of first identifying available aviation and non-aviation SMS software programs. The software providers were then contacted with requests for trials and demonstrations. Following the trials and demonstrations, the features of the programs were identified and categorized to determine a sample of the functionality standards for SMS software. Phase I also involved surveying airports willing to participate regarding their current utilization of safety or SMS programs and the required and desired functions of these programs.